Cat# IRN 22 on inside top right gatefold and C & D-side labels. Welcome to OUT OF THIS WORLD RECORDS ! Hi my name is Dave The RUF - I am a record dealer, professional DJ, record shop and record label owner with over 30 years experience. Please ORDER MORE THAN 1 ITEM if possible : this works out more cost effective on Postage for you per item! We respectfully advise customers outside the UK to make sure the record value exceeds the postage cost wherever possible. If you have any problems at all let us know BEFORE POSTING FEEDBACK as this is AGAINST Discogs advice! Refunds are given where applicable on the records cost. The cost of returning is strictly on the buyer. 12"'s / LP's - By Royal Mail only £3.99 for 1 record and 50p for each after. 7"/cd £2.99 for the first item - then 50p per additional item. We mail out of packages twice a week (except in Summer) and send 2nd class in the UK which gives proof of posting. International - we send by STANDARD Royal Mail post. If you want it sent TRACKED please tell us, this costs an extra £4.00 GBP (covers up to £50 goods value) and INSURANCE an extra £2.00 GBP (which covers up to £250). £7.50 for first record then plus £1.50 per additional record, doubles count as two separate records. 12"'s / LP's - £9.99 for first record then £3 per extra record. Doubles count as two separate records. If the order goes over 1kg we split this into 2 packs. 7"/cd £4.99 first item then £2 per additional item. 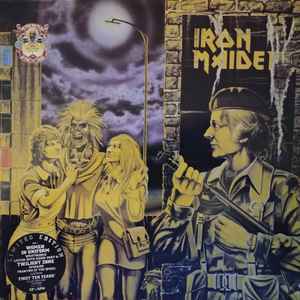 More Iron Maiden / Heavy Metal on our rated list! We run RUFS RECORDS - Top rated mail order service. We have 25 years selling records and DJ'ing and are led by our artist/DJ bosscat Dave The Ruf (Ruf Beats/Jeep Beat Collective etc) We have an amazing varied stock list and great customer service : please have a look if there's anything else you want... Thanks Dave!